The Lunar New Year is only a few days away, and if you're like me, then you've just awakened to that fact and are looking for some kid-friendly activities. Or maybe it doesn't make a difference to you one way or another. We happen to live in a neighbourhood that includes a significant Chinese and Vietnamese contingent. In other words, there's lots of talk about the upcoming celebrations in my oldest's kindergarten class. 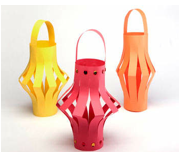 I did find, however, some idiot-proof construction paper Chinese lanterns on a crafting website. These are my kind of craft: at-hand materials, a minimum of steps, fully recyclable, and no essential preparation. I made two lanterns with three of my boys present in that late-morning time between peaceful play-time and lunch (you know, the period that starts around 10:30 a.m. and ends when the food reaches their stomachs?). Now, before you react to my supposed ingenuity, organizational prowess and child-management skills, please note that it states "I" made two lanterns. Hmmmm. Yes. The picture becomes clearer: an infant screaming alternately in his high chair and in his play pen; a toddler defiantly wadding up construction paper and throwing crayons on the floor; and a four-and-a-half year-old waving a pair of safety scissors and whining, "Mawwwwmeeee, it's too haaaaard!" Ah, yes, another family-bonding moment realized thanks to the magic of creativity.